All the issues that surround veal seem to be terribly controversial. Whether it’s veal production, veal eating or the treatment of the calves, talking about veal is guaranteed to get people hot under the collar. Perhaps it is a subject to be avoided over the dinner party table – or one to choose if you want a heated debate! So, what is veal and why do so many people disapprove of it? Veal is the meat from young male calves, generally around six months old. The males are taken from their mothers while they are still feeding as the males are not useful to a dairy farmer. When the calves are born, the females are kept for their future duties as milk producers. As the males cannot offer this function, they are not kept by the farmers. What happens next is essentially what the fuss is about. It is hard not to have sympathy with the male calves and, in turn, the majority of people, especially in the UK, that disapprove of ‘traditional’ veal production. Where Does Veal Come From? As there is no ‘purpose’ for the male calves, they are usually slaughtered. In the UK, strict slaughter laws have been in place for some time, with the use of crates outlawed since 2000 and thoroughly out of fashion since 1990. Crates are the transportation method for live animals. They allow only a small amount of space per animal (which, while it has recently been increased, is still a relatively small space, especially taking into consideration the long journey times, emotion and lack of water on such journeys). There are slatted floors which can be very damaging to the hooves and legs of the animals. However, many of the unwanted male calves are transported for slaughter outside of the UK, where the strict slaughter rules are not in place. Veal is not a popular meat in the UK, with less than one in one hundred households buying even once a year. It is terribly out of fashion due to the horrific animal welfare issues that surround it. It would be considered highly inappropriate and perhaps even offensive to serve veal at a dinner party – eating veal is a controversial choice, so cooking it for guests would be unfair. Veal is more popular across continental Europe, with France and Holland being the main consumers. In even the smallest French supermarket veal is available, with many butchers specialising in veal. 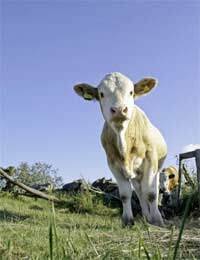 Recent developments in the UK have seen the introduction of the ‘Good Veal Campaign’, launched in 2006 by celebrity chefs known for their strict stance on animal welfare, such as Hugh Fernley Whittingstall and Sophie Grigson. The key differentiation is the development of ‘rose veal’. Traditional, controversial veal is called ‘white veal’ as the meat is very pale. This paleness is the result of the atrocious conditions the animals are kept in, with minimal iron, roughage and movement. Rose veal does not allow any of these conditions, so the meat is a pale pink. As of January 2008, Marks and Spencer’s have only sold rose veal, with Waitrose and other high end food retailers keen to follow suit. How Much Meat is Healthy to Eat?